Summary writing is a vital skill, which any English Language Arts student should acquire; learning to summarize will help them learn to analyze what they read, write concisely and paraphrase. This lesson will work well as part of a larger writing unit, or when studying writing. However, it would also be perfect as a one-off substitute lesson! 1) Get this in my 15 Writing Lessons BUNDLE & * SAVE* 20%! 2) Buy it in my 60+ ELA Lessons MEGA BUNDLE & * SAVE* 30%! This step-by-step plan will guide you through the lesson(s) - there is plenty of work here for two possible lessons. The first exercise in this lesson has students watching a TED talk. This handout will help them structure their notes while watching. 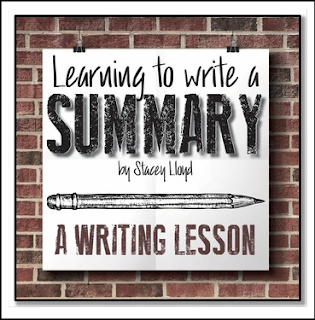 This page can be used whenever students have to write a summary - it helps organize their thoughts and contains a useful checklist for post-writing. This informational handout details the process students should follow when attempting to write a summary, along with useful tips and tricks.